Denmat SOL Portable Diode Laser is the ideal device delivers true portability, power and precision, along with enhanced ergonomics, simple interface, and a high-contrast aiming beam designed to make laser dentistry easier than ever, at a fraction of the price. Every Denmat SOL Portable Diode Laser is manufactured in California to the highest of quality standards and backed by a 2-year warranty. 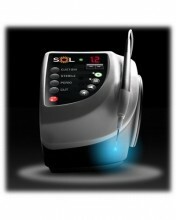 Click the button below to add the Denmat SOL Portable Diode Laser to your wish list.